The year 2014 failed to see less bloodshed in Afghanistan, despite the majority of foreign forces ending their missions in the country. The ICRC said it removed twice as many dead bodies from the battlefields in 2014, as compared to the previous year. According to a statement from the International Committee of the Red Cross (ICRC), the agency registered 1,372 deaths among combatants in Afghanistan last year, compared to 620 in 2013. This number does not include casualties among foreign mission staff, as they retrieve their casualties themselves. In #Afghanistan, @ICRC witnessed last year a 37% increase in its transport of wounded combatants from the battlefield to health centers. The Committee expressed fear that the number of victims among the population this year could be even higher, due to numerous attacks and increasing difficulties in accessing medical help. According to the ICRC, there was an 18 percent decline of people asking for medical assistance, simply because people were unable to reach hospitals run by the charity. "Persistent and fierce fighting, including serious violations of the rules of war, continue to have a deplorable impact on the Afghan population," Jean-Nicolas Marti, the ICRC head of delegation in Afghanistan, said in a statement on Monday. "For the victims of the conflict, the situation might deteriorate even further as the funding of humanitarian aid dwindles in the country." Afghan forces have assumed full responsibility for national security following NATO’s withdrawal from the country. They are continuing their fight against militants from the Taliban movement, who want to conquer the area. The Taliban has intensified attacks in Aghanistan, including foreign targets in the capital. In January, a total of six foreign nationals were killed after the Taliban targeted an EU police vehicle in Kabul. Although most foreign military troops have finished their missions in the country, over 10,000 foreign soldiers are still deployed in Afghanistan. The Obama administration experienced somewhat difficult relations with current Afghan President Ashraf Ghani when the leader took office. His predecessor, Hamid Karzai, refused to sign a deal on US troops staying past 2014 after the general withdrawal of international forces. The US demanded that remaining troops be immune to local prosecution, while Karzai opposed the provision. The civilian population is suffering from continuous militant attacks. The ICRC does not expect the situation to improve this year, but plans to continue its humanitarian activity in the country. "While the volatile situation on the ground continues to present challenges to the safe delivery of assistance, we remain committed to responding to the humanitarian needs in Afghanistan, as we have done for the past three decades," Marti said. 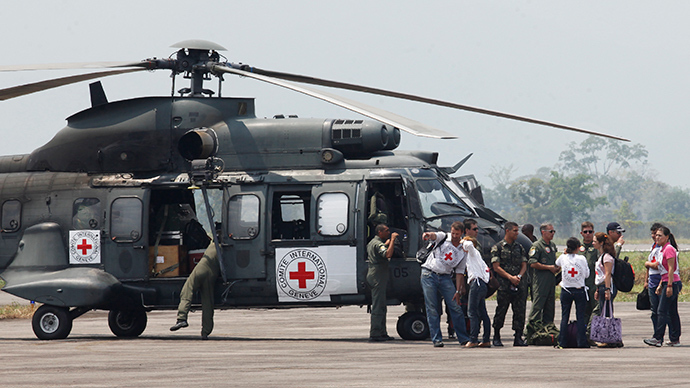 The ICRC is a humanitarian organization based in Geneva, Switzerland. It has a mandate to protect victims of international and internal armed conflicts which include the war wounded, prisoners, refugees, civilians, and other non-combatants.